Glen Eden manufactures 100 percent New Zealand wool rugs and carpeting for residential, commercial, aviation, and marine customers. 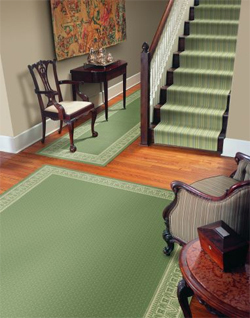 Here you can also find exclusive tapestry borders and woven Wiltons in both broadloom and area rugs. A wide selection of stock patterns, colors, and textures are available. Glen Eden also specializes in custom designing an endless combination of creative patterns, colors, and textures to meet customers' specific requirements. Glen Eden's highly skilled artisans are uniquely qualified to assist customers in designing their own carpet or rug creations. By combining old world craftsmanship and materials with advanced carpet-making technology, Glen Eden creates wool carpet of enduring quality and stylish sophistication.